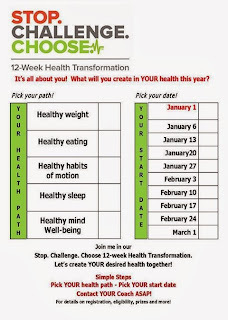 Health Coach Jobs | Health Coach Resource: Join us for the Stop, Challenge, Choose Experience! Join us for the Stop, Challenge, Choose Experience! 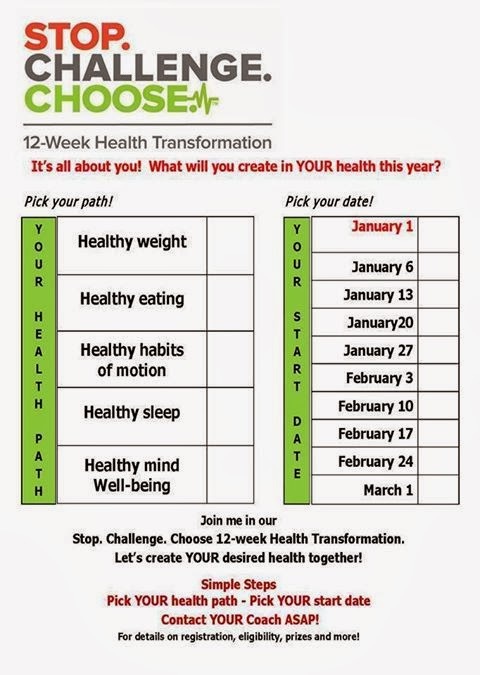 WE ARE SO EXCITED FOR YOU as you take this step to move forward in your Health Journey! Greg and I are doing it too!! Let's chat soon ... I'm at 503-313-4820 ... what's your schedule like? · Have a journal handy (notebooks work) to keep track of your goals and the daily thoughts as you discover more about yourself. It helps to print off the emails that are sent or you can keep them in a folder on your computer. · Take time to read the emails that are sent out daily…if you sign up mid-week, you'll get your first email on the following Monday. Write down your assignments in your journal - you'll get one or two per day. Don’t let it overwhelm you, keep it simple. · Weigh yourself on the Monday that you begin and take a picture of the scale number. · Measure yourself and write down your measurements in your journal. The tummy measurement is the most important. · Take a “Before Picture of yourself”. Whether your challenge is weight loss, better sleep, or stress management, take your photos and send them to me, I won't share them. Continue to call, text, or e-mail me each Monday to touch base, 503-313-4820. I am flexible and can work around your schedule. If Mondays don’t’ work for you, we can set another time for you. If you know anyone who would like to join the health transformation, we would love to add them to our team of “like-minded people” who want to create better health in their lives. Just let me know!